The Panthers beat the Dallas Cowboys and will begin the season 1-0, but just like their 9-3 victory in their home opener over Buffalo last season, the victory will likely be pyrrhic as three-time Pro Bowl tight end and 2018 captain Greg Olsen spent the second half watching the game from the sidelines on crutches with a boot on his right foot, the same one that sent him to injured reserve last season for over half of the season and Daryl Williams, who tore his MCL and dislocated his patella only six weeks earlier and some thought would start the season on injured reserve, was carted off the field in the fourth quarter with another knee injury after starting the game at right tackle. While Olsen watched, the offense struggled without him. 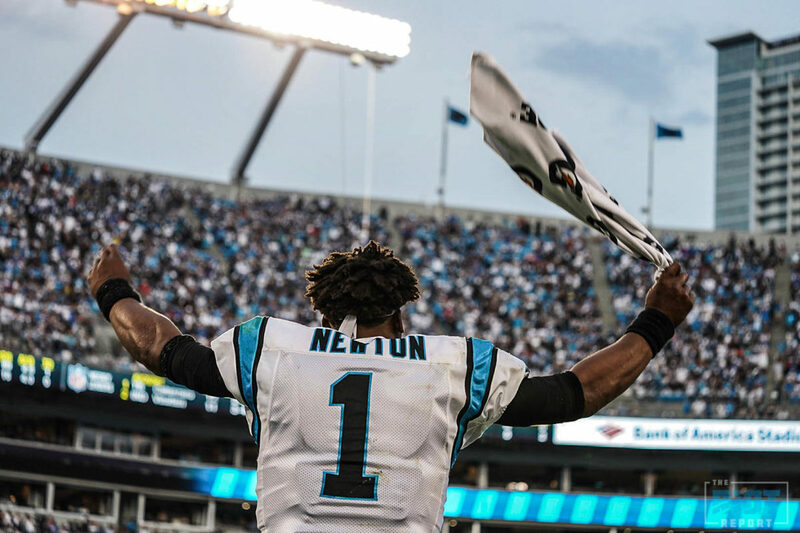 The Panthers started with 103 yards in the first quarter, including 59 yards rushing for quarterback Cam Newton, who would finish with only 64 yards, enough to lead the team – Newton would finish the day 17-for-26 (65% for those counting at home) for 161 yards and no passing touchdowns or interceptions. With Olsen in the game, the Panthers had a long opening drive that was derailed when they gave running back Christian McCaffrey – he of the expected 25-30 touches per game – a handoff on a third down inside the five-yard line who lost the handle; that fumble took the steam out of a drive that featured three Cam Newton rushes for 45 yards and the first NFL touches for rookies Ian Thomas and DJ Moore. The second time the team threatened inside the five, Cam Newton took it himself. You probably know how a Cam Newton carry inside the five finishes. 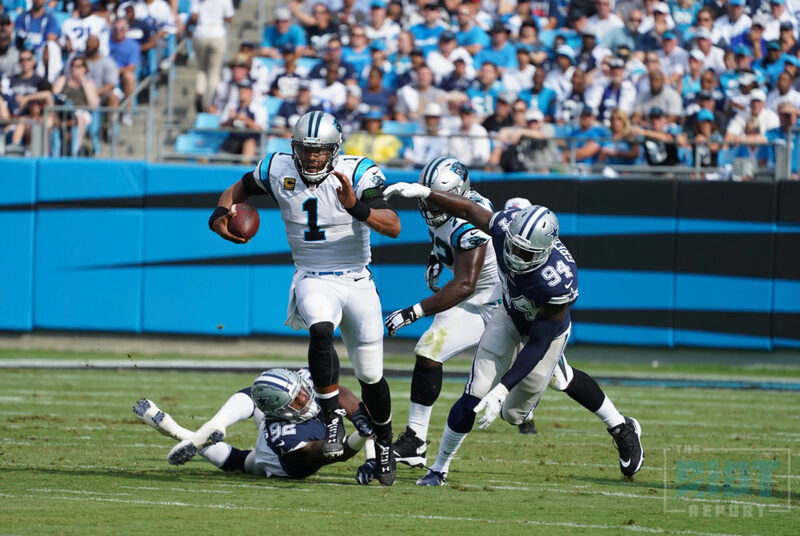 Newton scored the 55th rushing red zone touchdown of his career just about halfway through the first quarter – 55 is the most by any player in the NFL, quarterback or running back since Newton was drafted in 2011 and the Panthers never looked back as Newton’s legs and a stingy defense propelled them to a win over the Dallas Cowboys to open the 2018 season. A stingy defense doesn’t just mean it was hard for Dallas to gain yardage – it was next to impossible for three quarters of action. Luke Kuechly and the Panthers defense were dominant in the first half, not allowing the Cowboys to cross midfield – the Panthers had 23 plays on the Cowboys side of the field in the first half if you’re counting – and holding the Cowboys without a first down in three third down conversion attempts. Luke Kuechly did Luke Kuechly things – he would have six tackles in the first quarter and finish with 13 tackles, including a thrilling first half sequence in which he called out the Cowboys screen pass ahead of the snap and then made the tackle. He also terrified Panthers fans by being attended to by doctors in the fourth quarter and limping off the field – after being checked out, the all-world linebacker checked back in on the next drive. Ezekiel Elliott, who many consider to be the best running back in the league, was limited to 39 yards on 10 carries through three quarters, with 17 of them coming on one rush. The Cowboys longest drive was 46 yards from a yardage perspective – 4:24 from a time of possession perspective; both of those drive ended in punts. The Cowboys had eight third downs and only converted once; that drive ended in a missed field goal. 82 net yards – only 23 rushing.  The Panthers went into halftime up 10-0 and while they let up a little – the Cowboys crossed midfield with just under nine minutes left in the third and had their first third-down conversion four minutes later, but the Panthers wouldn’t allow points on that drive either after kicker Brett Maher missed a 46-yarder on what was the Cowboys’ furthest trip into Panthers’ territory to that point. The Panthers would take advantage of that missed field goal to march 58 yards on six efficient plays – two passes to Devin Funchess, including a dart between two defenders that was made possible by Newton having all kinds of time in the pocket; a beautifully designed triple-option pitch that resulted in a 15-yard gain for Christian McCaffrey; a CJ Anderson dart up the middle to inside the one-yard line and the first touchdown of fullback Alex Armah’ career to put the Panthers up 16-0. The Cowboys would make it a game by putting together a 65-yard drive that ended in a four-yard touchdown run by Ezekiel Elliott and a two-point conversion for Dak Prescott on a run up the middle – the Cowboys spread the Panthers wide on the two-point attempt and Prescott ran up the middle for the score. However, the Panthers defense stiffened when the Cowboys got the ball back – sacks by Kawann Short, who had two on the day, and Wes Horton, who had 1.5, forced Dak Prescott and Dallas into a desperate fourth-and-10 that fell incomplete near midfield with just under three minutes left and their final drive would end with a Dak Prescott fumble caused by Mario Addison. The game was delayed ten minutes due to lightning and weather in the area, but the rain stopped about 45 minutes before kickoff and the weather held; Bank of America Stadium was hot and sticky with temperatures in the eighties and the humidity hovering around 60%. A 30-yard punt return by Damiere Byrd set up the Panthers first score as they began that drive at the 35-yard line and took seven plays to punch it in with Newton’s rush from the four. Amini Silatolu took Williams’ place at right tackle after Williams was carted off in the fourth quarter. 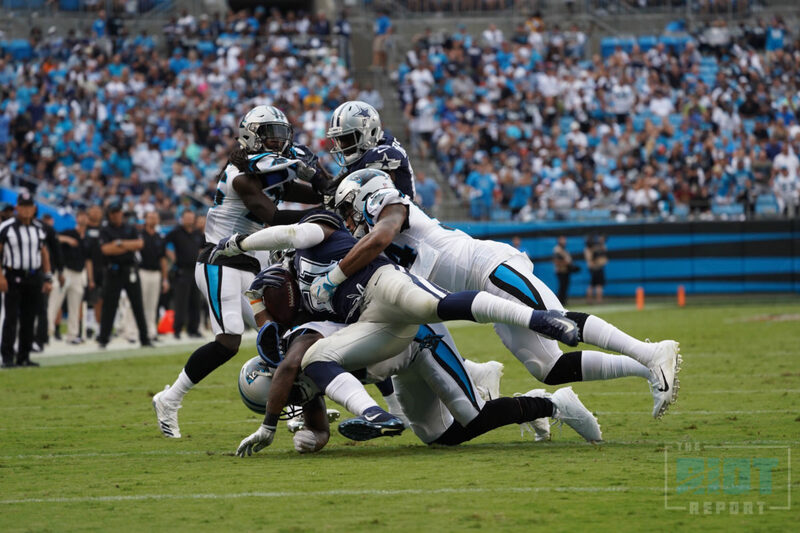 Alex Armah scored his first NFL touchdown on his first NFL carry in the third quarter to put the Panthers up 16-0; the ensuing extra point was snapped over holder Michael Palardy’s head. Not surprisingly, there were a fair amount of Cowboys fans on hand, the ovation when Prescott scored on the two-point conversion was palpable.